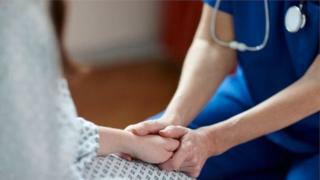 NI health trusts have almost trebled the amount spent covering the shortage of doctors in hospitals in six years. A Northern Ireland Audit Office (NIAO) report shows total expenditure soared from £28.4m in 2011/12 to £83m in 2017/18 - an increase of 192%. Locums are doctors who provide temporary staffing cover in hospitals. Auditor General Kieran Donnelly said the reliance on locums was "unsustainable" and rising costs putting "huge strain" on budgets. In the Northern and Western Trusts, nearly a quarter (22%) of their total medical pay bill is spent on locum cover. The use of locum doctors is important in the delivery of healthcare in hospitals, however, they cost significantly more than permanently-employed doctors. The report finds that their use has the "potential to increase risks to patient safety". While reliance on locum doctors has gone up substantially across the board, their use in the Northern and Western Trusts is singled out by the report. The report notes that the amount being spent to fill gaps in hospital rotas to maintain services is "placing a significant strain on already stretched budgets". It found that trusts are very heavily reliant on locums who come via an agency, and they cost more than locums who are directly employed by the health service. In fact, the total agency spend has risen from just over £23m in 2011/ 2012 to £73.5m in 2017-18. According to the Audit Office, "the department and the trusts have made no tangible progress implementing effective solutions" to reduce the heavy reliance on locums. It said that, until recently there's been "little progress developing workforce planning solutions to identify the optimal number of local doctor places required". Better workforce planning, it says, could help in the long term to cut down reliance on locums. Mr Donnelly said that "to help ensure that patients' needs are best met and provide better value for money it is now imperative that the department and trusts collectively progress the transformation agenda and formulate strategies for delivering a suitably resourced and sustainable medical workforce". A separate report by the Audit Office into patient safety said that the costs of settling medical negligence claims and the estimated costs for unsettled cases had risen significantly, from more than £252m in 2007/8 to 2011/12 to £393m for 2012/13 to 2016/17. That is an increase of 56%. Mr Donnelly described the rise in settling negligence claims as "concerning". "These costs divert scarce resources away from frontline services and potentially result in patients waiting longer for treatment," he said. The review finds that some headway has been made in some areas of patient safety including higher levels of reporting of adverse incidents, better public reporting on patient safety performance by trusts and more patient involvement in SAI (Serious Adverse Investigations). But it also finds there may still be under-reporting of SAI's and says the department needs to think about why staff do not think that reported incidents will be properly investigated and why they do not believe information is being shared properly. "Whilst steps have been taken to try and enhance local patient safety standards and evidence suggests that more incidents are being reported, further work is required to embed a strong safety culture across the health and social care sector," said Mr Donnelly.